Rasteau is a small village (population 696) located in the Southern Rhône wine region a short three miles east of Cairanne and 10 miles north of Gigondas. Until about twenty years ago, Rasteau was most known for Vin Doux Naturel (VDN) or muted-sweet wines. In fact, Rasteau gained appellation status in 1967 because of these sweet wines. These were made from overripe Grenache, whose fermentation was stopped with the addition of alcohol, yielding a rich red wine like port. As Beaumes de Venise was known for its sweet white Muscat, Rasteau was known for its sweet red Grenache. These sweet reds are still made in Rasteau but are no longer very popular, even locally. Understandably, as the popularity in sweet wines has dwindled, the trend to make dry wines that can be sold the same year and be consumed in larger quantities has greatly increased. 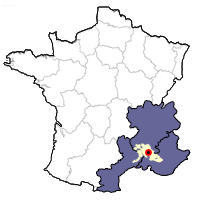 The total area cultivated with grapes in Rasteau is 658 hectares (1,625 acres), making it about half the size of Gigondas and about the same size as Lirac. The soil has a high percentage of clay and marl, with some red soil mixed in with sandstone. According to the appellation laws, Grenache must be used in at least 50% of the blend. Syrah and/or Mourvèdre must total at least 20%, while other grape varieties may be used to a maximum of 20%. Charavin is a common name in Rasteau, and there are four producers who carry this name. 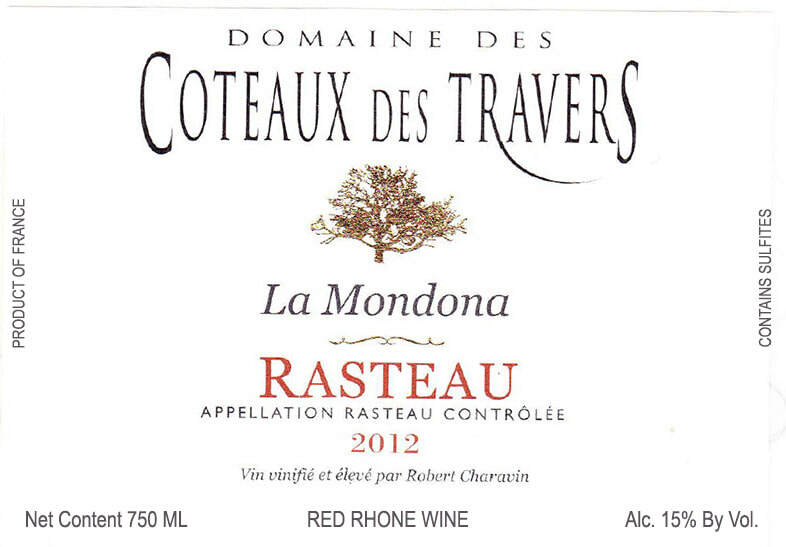 Domaine des Coteaux de Travers (literally domaine of the slopes on the side of the rising sun) is owned by Robert Charavin. Its history dates back to Robert's grandfather Elie, who began cultivating the vines in 1931. Following the Second World War, the domaine expanded greatly. Robert Sr. took over in 1955 and, in 1976, sold his first wines in bottle. 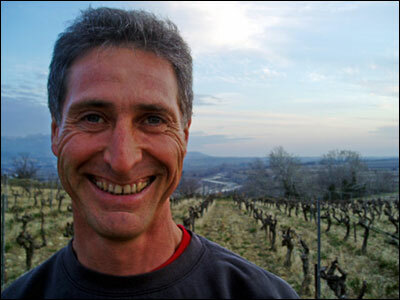 Robert Jr. took over the domaine in 1985. Robert began giving up weed-killers and synthetic sprays around 2008 and since 2012, has been certified biodynamic by Demeter. Charavin works rigorously in the vineyard plows between his rows of vines to encourage healthy underground life. Leaf plucking and a small green harvest to limit yields and maximize concentration have become the norm. Harvest is normally in early September and is done entirely by hand, with any bad grapes being left on the ground. After that, a sorting table manned by ten people make sure that only grapes of exceptional quality make it into the tanks. Char à Vin 50% Grenache, 30% Carignan, 10% Mourvèdre, 10% Syrah. A char is a military tank in French, and this release is a play on that word, as it is made in tank (enamel-lined vats). Clay and limestone soil with a slightly sloped, full Southern exposure. Vines range between ten and twenty years old. Grapes are destemmed, then aged in tank for 3 weeks. Tasting Notes: Notes of cherry, wild plum and raspberries on the palate. Rich and round mouthfeel, with more cherry and a touch of white pepper. Enjoyable bistro wine. 60% Grenache, 30% Syrah, 10% Mourvèdre. The soil is a mix of clay and a large quantity of limestone, with the vines exposed to the south and southwest. Made from old vines (40-60 years old) with a low yield of 35 hl/ha (just over 2 tons an acre). The harvest is destemmed and the fermentation lasts 24-28 days with punch-downs of the must (pigeage). This allows for wines that are robust and very aromatic. The wines age well for 4-6 years. Tasting Notes: The aromas of this wine jump from the glass, with plenty of blackcurrant and wild plum notes. A touch of fig and blackberry comes through on the palate. Full-bodied on the palate, with round, well-integrated tannin. Charavin also has several parcels of vines in neighboring Cairanne that total 4 hectares (10 acres). The plots themselves are spread out, so soils vary (sand, clay/limestone, and red and rocky). The vines on the parcels are old, averaging 40-60 years, with 35 hl/ha yields (just over two tons an acre). ​Tasting Notes: Shows a powerful nose of wild myrtle, cherry and plum. Full-bodied yet with some finesse, this wine is great with any sort of roasted meat.